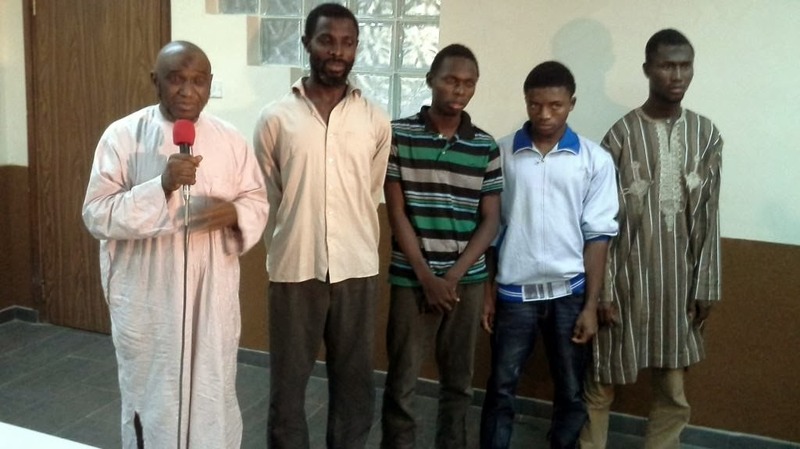 The State Security Service (SSS) today in Abuja paraded five suspected Boko Haram members alleged to have planned deadly attacks on Igala, Kogi State. Among the suspects were Dr. Mohammad Nazeef Yunus, an Assistant Lecturer in Arabic and Islamic Studies at Kogi State University. He was said to be the Spiritual Leader and Coordinator for Boko Haram in the State, and the leader of the gang. Nazeef, who was born in Idah, Kogi State, attended the Arabic Central Primary School in that town, and El-Kanemi College, Maiduguri. He also studied at the Islamic School, University of Medina, in Saudi Arabia and served in the National Youth Service Corp in 1995 at Al-Iman Secondary School, Dogon Dutse, in Jos. Nazeef earned a Masters Degree in Arabic from the University of Jos. Just last year, he earned a Ph.D in Islamic Studies from Kogi State University. Also arrested by the SSS were Umar Musa (Instructor), Mustapha Yusuf, Ismaila Yunusa, Mohammed Nasir, and Ibrahim Isa. SSS spokesperson Marilyn Ogar said the suspects were planning to carry out an attack on Igala Land but were arrested at Zuba white mosque near Abuja on their way to Zambisa in Maiduguri for training. They were also going to install Sharia in Kogi State. Umar Musa (Head of Operations/Instructor) confessed publicly that he was employed by Boko Haram as Instructor after he lost his job with the state teaching hospital, and was taken to the Sambisa camp of the sect for a week’s training on handling weapons. He said he was deployed to the education unit of the camp as Munzi (instructor) and placed on a monthly salary of N50,000. He further stated that he and Yusuf later returned from Sambisa and re-united with Nazeef in Kogi State where they plotted to carry out violent attacks in Igala land. He maintained that Nazeef appointed him the Head of Operations and munzir. Mustapha Yusuf (Armourer/Chief Courier) and Ismaila Abdulazeez (Foot soldier) confessed that that Nazeef was their teacher who teaches them Jihad and Islamic Sharia. Ogar told newsmen that the suspects will soon be charged to court.